Nantucket 05A - Spring availability – won’t last long! Nantucket Rainbow Cottages 5A is professionally managed by ResortQuest by Wyndham Vacation Rentals. Enjoy this wonderful beach inspired unit with a peak of the Gulf waters from a private 2nd floor balcony. The master bedroom has a cozy queen bed with bold striped bedding and nice beach artistic touches. The kids are sure to love the fun bunk beds also with custom striped bedding. The bathroom features frameless shower doors and custom tiled walls. There is no bath tub for this unit. The living room and the master bedroom have TV’s and DVD players. There is also a CD stereo system for your listening pleasure. Upgrades include stainless steel refrigerator and stove. There is a centrally located coin operated laundry room also for your convenience. 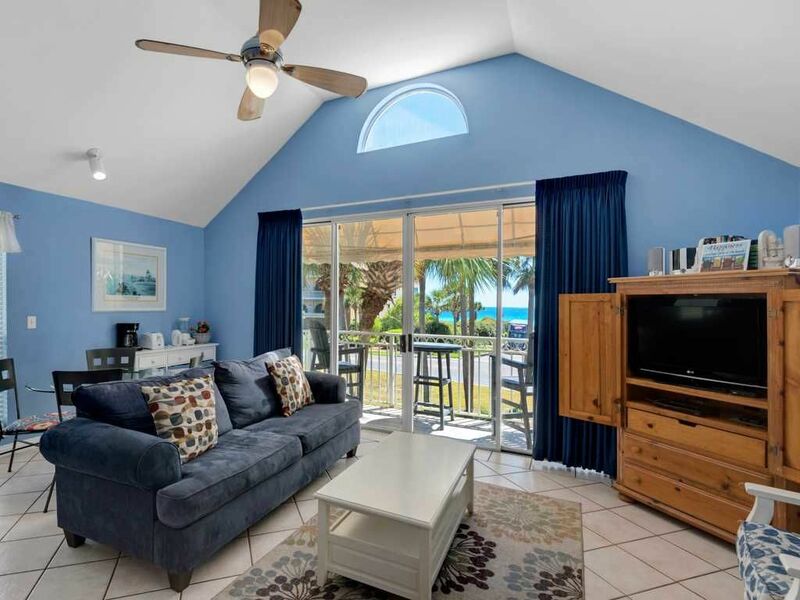 Come and make this wonderful beach unit your next vacation by the beach. Served our needs well. Only complaint was the mattresses were too hard. Other than that everything was great! Thank you Matt for your review, happy to hear that you enjoyed yourselves, except for the mattress. Please return again soon. Unit has everything you need. Could use a new sofabed. Thank you Cindy for your review. We hope you can return soon. Absolutely loved the place. Sat out on the balcony every morning to watch that sunrise. When we first arrived the toliet wasnt flushing and once i call the resort after hours line, they had an awesome guy there within 10 min. If i could have stayed longer i would have. Thomas, we are so happy to hear you enjoyed your stay at Nantucket Cottages! Your guest experience is our top priority. Thank you for taking the time to write a review about your vacation after you returned home. We hope you are able to visit again soon.